I liked this book and the funny part was when peter and Henry’s face turned green and they both got sick in the car. Love it. I think that this book is funny because Horrid Henry and Peter puke on Mum and Dad! I won’t tell you any more in case I spoil it for you! All I’ll say is that Francesca Simmons is a very talented author! Horrid Henry books are really funny! I would recommend this to anyone who loves to laugh. 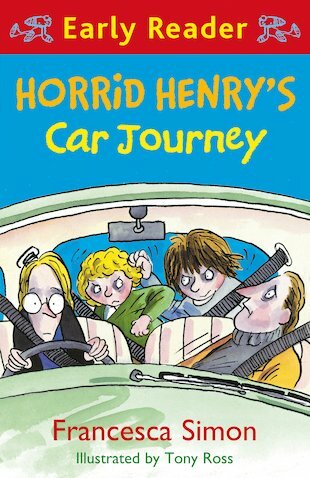 My favourite part of the book was when they all stopped at the service station for a rest and to go to the toilet and henry locked himself in and pretended to be trapped inside, unfortuanately he had locked himself inside a toilet with a gap underneath! I also liked the good twist at the end… But you will have to read the book to find out! I also enjoyed the fact that I could read the whole book in 1 evening as a bedtime story as I could not put it down, iit was so good! I rate this book 10/10 because it was the best horrid henry book I have ever read as I could read most of the words rather than getting mum to read most of the words!